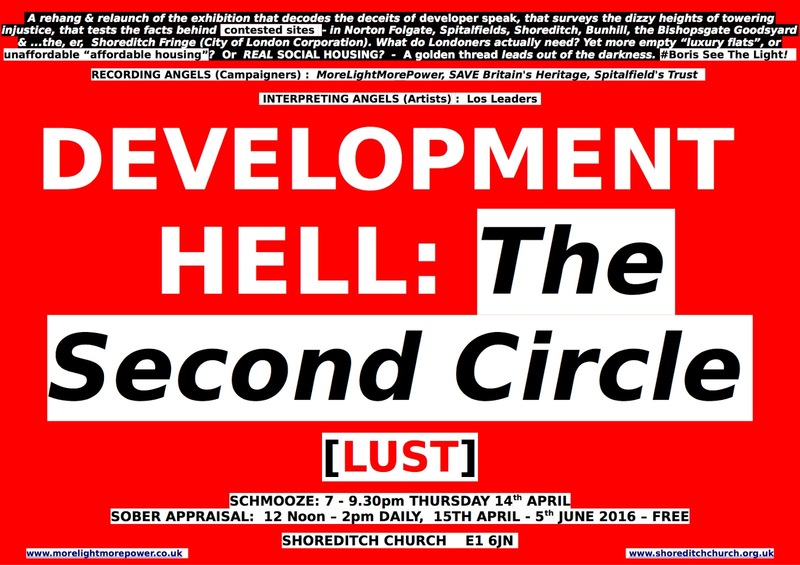 Roll up, roll up, for the final couple of weeks of Development Hell - showing at St Leonard's, Shoreditch. If the name makes you feel gloomy, let me assure you, a visit to this church raises the spirits and the exhibition is full of humour as well as dark realities. 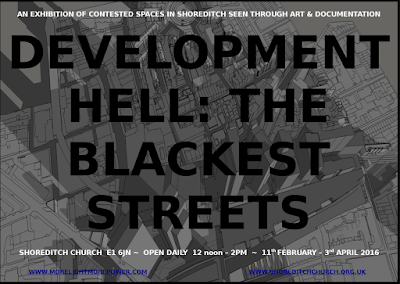 Development Hell was conceived and curated by Robin Hatton Gore who organises events at the church, to be "An exhibition of contested spaces in Shoreditch seen through art and documentation.” It is about local planning battles, which happen to be some of the fiercest in the country: Bishopsgate Goodsyard, Norton Folgate, and others. These fights have given rise to a great pulling together and creativity, and this exhibition exemplifies that. 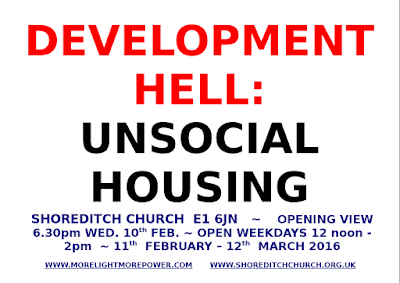 Development Hell acknowledges the importance of these fights - recognises their injustice - and celebrates the creativity of the campaigners, as well as giving campaigning tips. The bravery and willingness of this church to be outspoken make it something of a crusader. 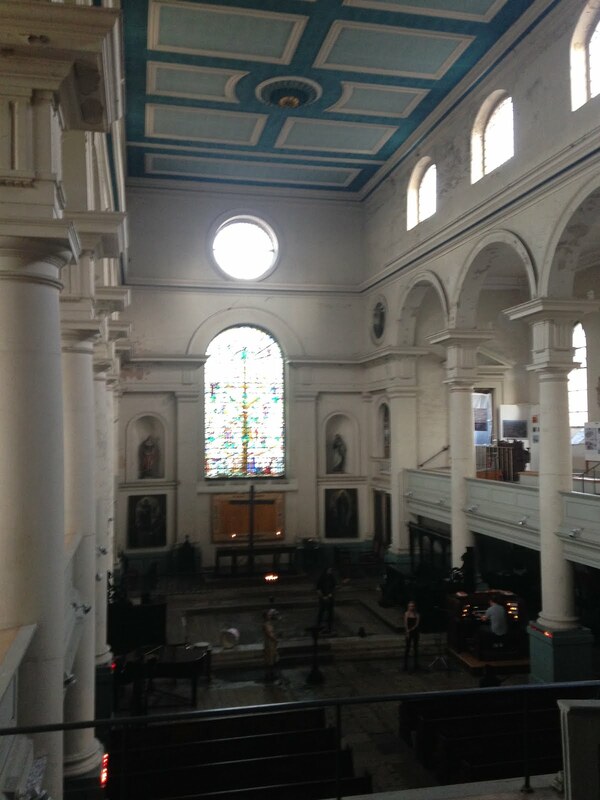 The elegant Grade 1 listed building was completed in 1740 by architect George Dance - though there has been a church on this busy Shoreditch junction for hundreds of years. 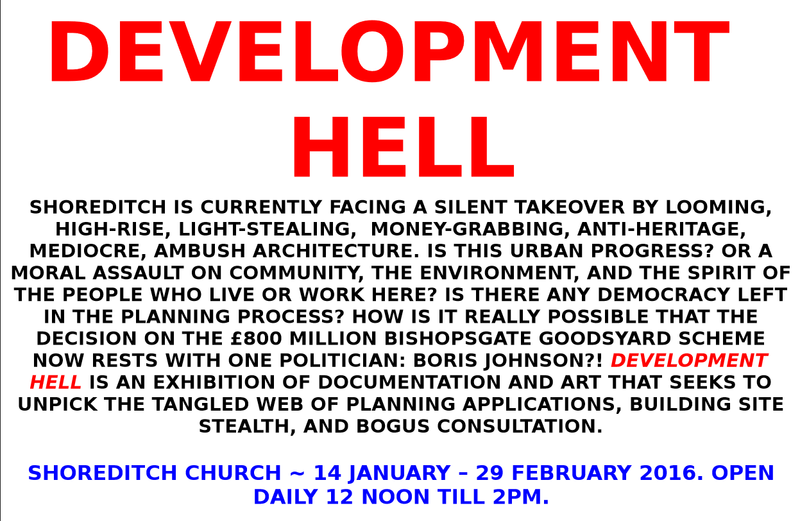 Unlike the proposed new towers that the exhibition opposes, the church is positively engaged in the local community. It has a drop in centre for those suffering from addiction, 12 step meetings are held there, as are fundraising concerts for charities, and cultural events. The church’s vicar Paul Turp, a man of refreshing honesty, in and out of the pulpit, together with Robin, recognised that the community is not being given a voice in the gargantuan and invasive plans for the Goodsyard and Norton Folgate. They held a first exhibition last year drawing attention to these planning applications with a view to providing the community with a platform and empowering people to object. 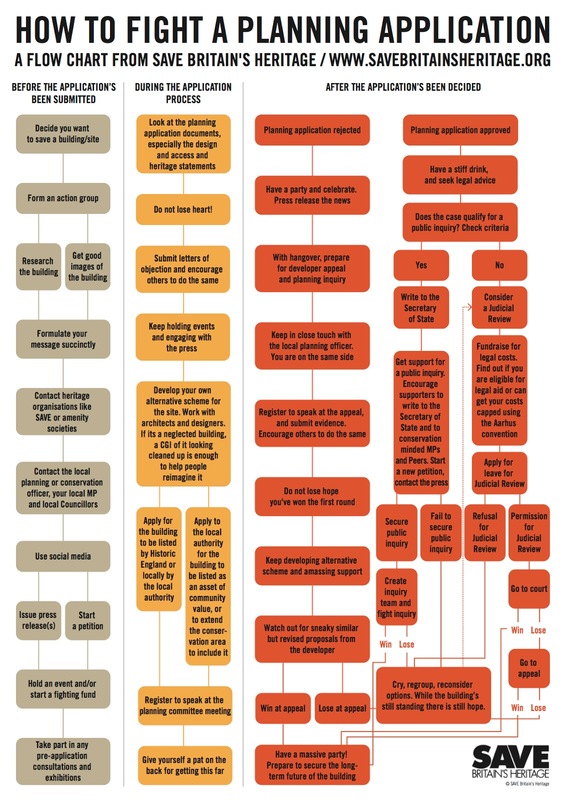 They have held several fundraisers in the church for the same purpose. 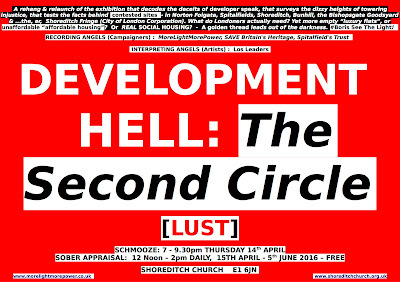 This second exhibition is more ambitious and very much worth a look. Robin, an artist by training, has mounted the show beautifully in the light-filled gallery, rebuilt in the 1990s after it was stripped out by zealous Victorians in the 1870s. A fine organ, dating to 1756 presides over the exhibition. 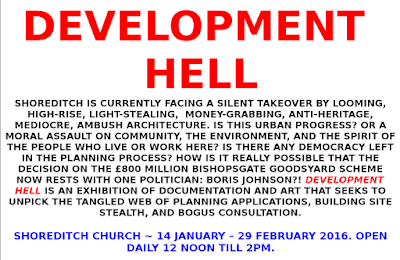 Other organisations taking part are: SAVE Britain’s Heritage, the Spitalfields Trust - so fiercely battling for the right solution in Norton Folgate, and the terrifyingly named GAG - Goodsyard Action Group, fighting the Bishopsgate Goodsyard plans for a wall towering skyscrapers, together with action group More Light More Power. 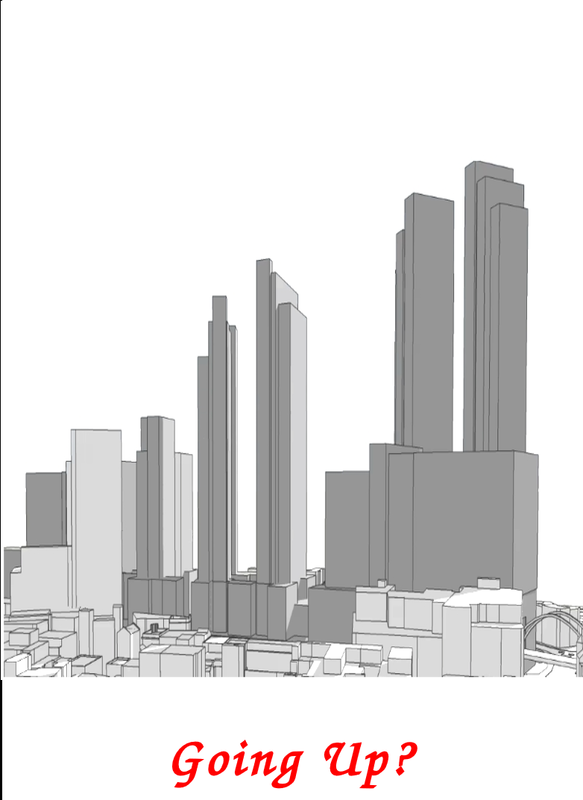 As a counterbalance to the threatening darkness, Robin invited artist Andrea Mclean who lent a picture depicting William Blake’s vision for a City of the Imagination, Golgonooza. Other artists taking part are Gram Hilleard, Adam Dant, Jamie Reid and The Artist of the Ant, Paul Sakoilsky, Neil Cummings, Lucinda Rogers and photographer Max Reeves. Poet Stephan Micalef wrote some poems for the exhibition which are included. 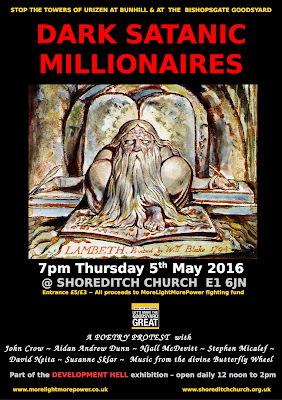 Earlier in May, Robin also organised a protest poetry evening of poets reading their work about the developments, with a Blakean theme, called Dark Satanic Millionaires. Robin has made some stunning posters for the exhibition that I include here: their punk aesthetic and thoughtful content are activism of a powerful kind. 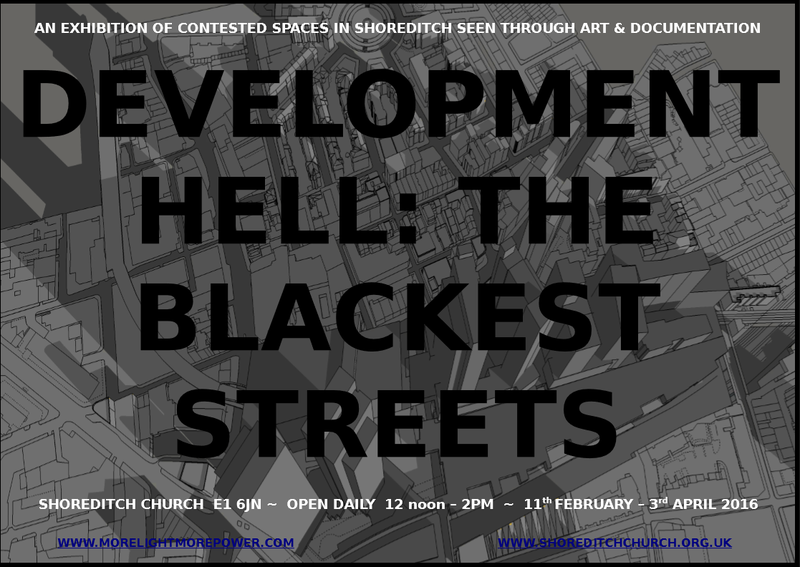 They have a Blakean theme, calling the campaigners 'recording angels', and the artists 'interpreting angels.’ I remember one of my predecessors at SAVE citing ‘wanting to be on the side of the angels’ as being a major motivation for developers to stop fighting the local community and to work with them. Let’s hope that this exhibition creates a few angels. 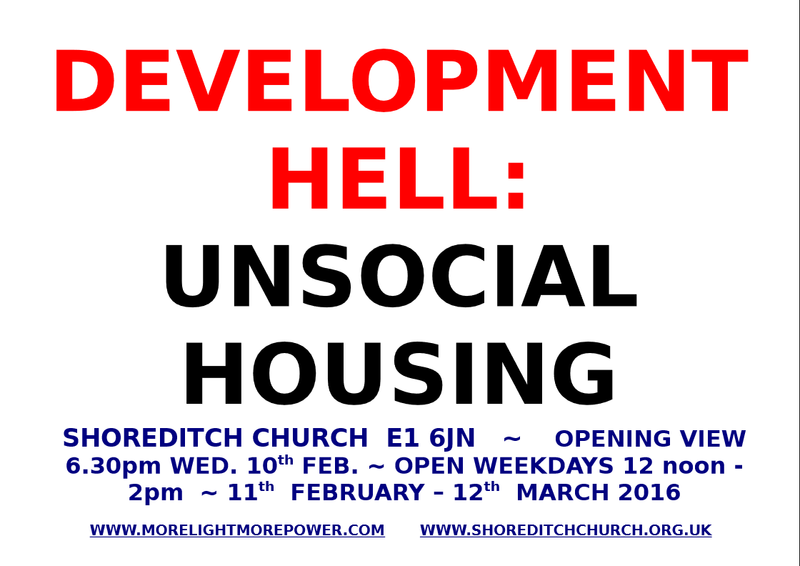 Go and have a look and take your local property developer.